He makes it sound so effortless but my god they have work to do. I hung out for the most part at the City of Copenhagen stand. I had the opportunity to meet scores of great people - most who knew this blog and copenhagencyclechic.com - and to put faces to alot of names. The mood was wonderful throughout the week and the City of Copenhagen stand was a busy spot. 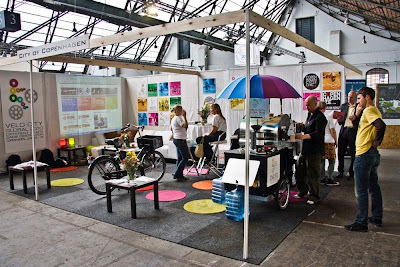 Apart from me, the City invited Henrik from Baisikeli [used Danish bikes for Africa] and Ole with his Coffee Bike. In addition there were 8 people from the Copenhagen Bicycle Office and the traffic department. We were busy at the Copenhagen stand because, well, we're Copenhagen but also because the city is hosting the Velo-City Global conference next year where the whole world will come. Free coffee from Ole's coffee bike was also a magnet. There were many stands around the exhibition area, mostly European. Some bike brands but also cities and towns and NGOs. I found myself speaking non-stop in three languages at the stand and when I needed a break I'd head out to a Belgian NGO Cyclo who had a little cycle ring where you could ride their bikes. It was interesting to see how so many European bicycle advocates are not gearheads. Just regular people with a love of bicycles and bicycle culture. 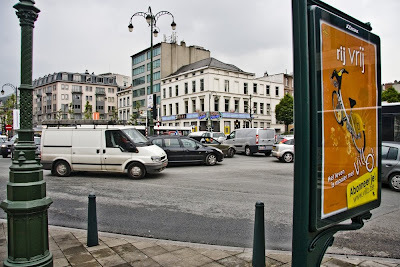 The City of Brussels has bike lanes but most of them lack logic. You're separated from the traffic and then chucked back in. And repeat. But these lanes, above, were freshly painted - as though in a hurry because of the VeloCity conference - but at least they show there is some political will. I don't know about this bike rack though. Maybe a truck went around in the dead of night, chucking them out before the conference started. Here's a more civilised separated lane. For 100 metres at least. The city just started their own bike share programme Villo, as you can see on the poster. On our last day there was a transport strike. Usually prime time for bicycles to be pulled out of the garage. Instead, traffic jams. The Deputy Mayor of Copenhagen, Klaus Bondam, came on Friday and spoke at the European Parliament, after which he showed my little music video about Copenhagen's bike culture. 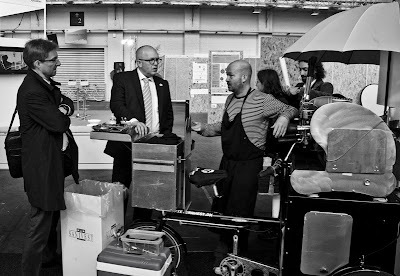 Here he is talking bicycles with Niels Tørslev, head of the Copenhagen Traffic Department and Ole with the coffee bike. There were loads of lectures about all manner of bicycle subjects. One of them was interesting, not least because we've been banging on about it for ages here on Copenhagenize.com. Marketing the bicycle. Can you make a 'hero brand' out of urban cycling? A Belgian marketing guy, Guillaume Van der Stighelen, co-founder of the marketing company Duval Guillaume spoke about how if you want to get people to ride, you have to forget about telling them about safety, about how healthy it is and all that. Just make it stylish and cool. The president of the European Cyclists Federation asked Guillaume a question on his blog and you can read the answer here. "There is no reason for this strange behaviour. Some will say you can’t ride a bike in your office suit. Nonsense. You don’t need lycra to ride. You don’t have to race that bike. I rarely go faster than twenty kilometers an hour. Doesn’t make me sweat." "That’s where your fight is, Dr. Ensink. Nothing to do with saving the planet or shaping your body. It is status. Your industry has to think how they can giev status to bikes in the city. Don’t think it is impossible. I’ll give you an example. The hotel where I stay in New York offer free bikes for guests since last year. They are cool shoppers, shiny red with the logo of The Bowery Hotel. At night, when I’m meeting some friends in the very fashionable venue for fancy advertising people The Odeon, I get more looks than anyone who would arrive in a stretched limousine. There is a large terrace, and you can tell from the ladies’ faces, this guy is cool, he’s healthy, his success is big enough not to depend on car brands. Wow. That is where you want to be, Dr. Ensink. And most of the communication I see from bike brands, city bike organisations and biker’s federations won’t get you there." Indeed. We need to stick our fingers in our ears and shout "lalala" when the safety freaks and sub-culture geeks talk about cycling. The average person won't listen. Making a hero brand of urban cycling requires a whole different approach. Thought you were going to get off without a mention of helmets, didn't you? Wrong. 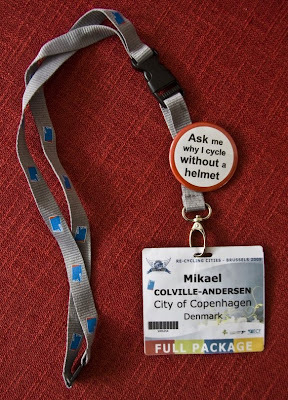 The European Cyclists Federation, the umbrella org that represents most of Europe and who hosts the VeloCity Conferences produced this button, attached to my badge, along with a brochure. Not some little NGO, the ECF itself. They printed 500 of them, thinking they could use them throughout the year but they were all gone after day 3. A real hit. Nice to know that there are so many people out there in Europe who would rather be bicycle advocates instead of helmet advocates. I had great, positive conversations with like-minded bicycle advocates from Britain's CTC, the Dutch Fietserbond, including their traffic consultent Theo Zeegers, as well as advocates from Poland, Germany, Belgium, France, Spain, Catalunya, Italy. All wearing these buttons proudly. The conference wrapped up at the European Parliament with the signing of the ambitious Charter of Brussels for Europe. EU Vice President, Siim Kallas presented how the European institutions are promoting cycling to work and the European Commissioner for Transport, Antonio Tajani opened the conference on Tuesday 12 May by explaining the key role the bicycle has to play in the action plan of the Green Urban Transport Paper. The European Parliamentary debate saw the constitution of a parliamentary intergroup for cycling in the European parliament being discussed as well as appointing a European Bicycle officer within the European Commission. The goal in the Charter is that the EU has a 15% modal share for bicycles by 2020. For a change, I feel that is actually a feasible political goal.